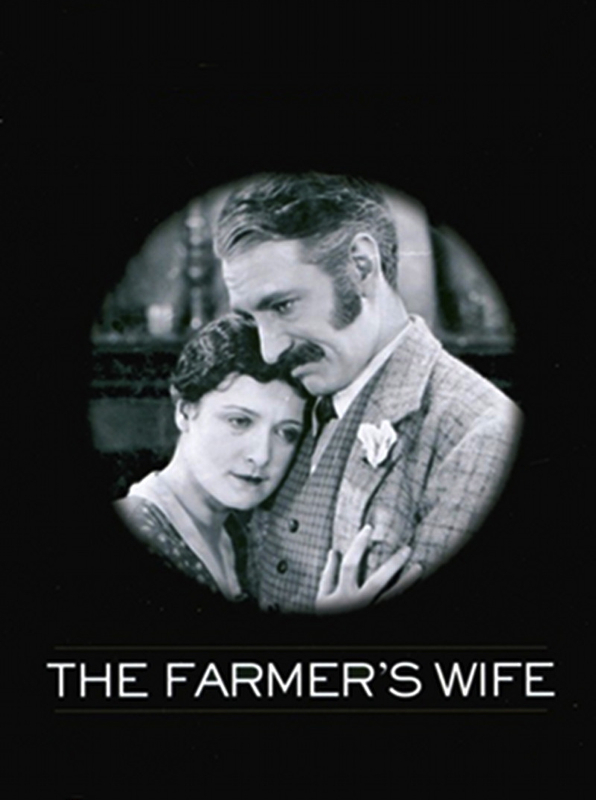 Synopsis: Following the death of his wife, Farmer Sweetland (Jameson Thomas) is convinced by his loyal housemaid Minta (Lillian Hall-Davis) that he ought to remarry. Making a list of all the eligible bachelorettes in town, Sweetland sets out to invite them one by one to be his bride; unfortunately, the women are not as flattered as he’d imagined they’d be. Will Sweetland ever be able to find a woman suitable enough — and agreeable enough! — to take the mistress’ place? This is an official entry in the prestigious For the Love of Film preservation blogathon benefiting the National Film Preservation Foundation. Jointly hosted by Ferdy on Films, the Self-Styled Siren, and This Island Rod, this year’s goal is to raise enough money to provide a glorious new score and FREE online streaming for 1923’s The White Shadow, the first film Alfred Hitchcock had a major role in creating. To learn more, click the banner at left, and to donate to this worthy cause, kindly CLICK HERE or on the donation button below. I very much enjoyed participating in last year’s For the Love of Film blogathon, so no matter the chosen topic, I knew I’d want to do it again this year. However, my discovery that the beneficiary of the proceeds from our fundraiser would be a silent film on which Alfred Hitchcock served as assistant director could not have come at a more convenient time. It just so happened that I had just purchased one of those cheapo four-disc, twenty-movie box sets that featured some of Hitchcock’s early works. Here on Garbo Laughs, I’m dedicating the entire month of June to the topic of Queer Cinema (LGBTQs, and depictions thereof, in classic film). This includes reviewing one relevant film from each decade from the 1910s to the 1990s. This is all leading up to my Queer Film Blogathon on June 27th. Won’t you join me in celebrating LGBTQ Pride Month by contributing a post or two (or three)? Synopsis: Richard Hannay (Robert Donat), a Canadian man on a visit to England, decides one night to attend a show at the local music hall around the corner from his rented apartment. Unexpectedly, shots ring out in the theater and all the patrons scurry to evacuate. Upon exiting, Hannay is approached by a mysterious woman (Lucie Mannheim) who asks if she can come home with him. The woman identifies herself as Annabella Smith, a foreign agent trying to prevent enemy spies from smuggling British military secrets out of the country. 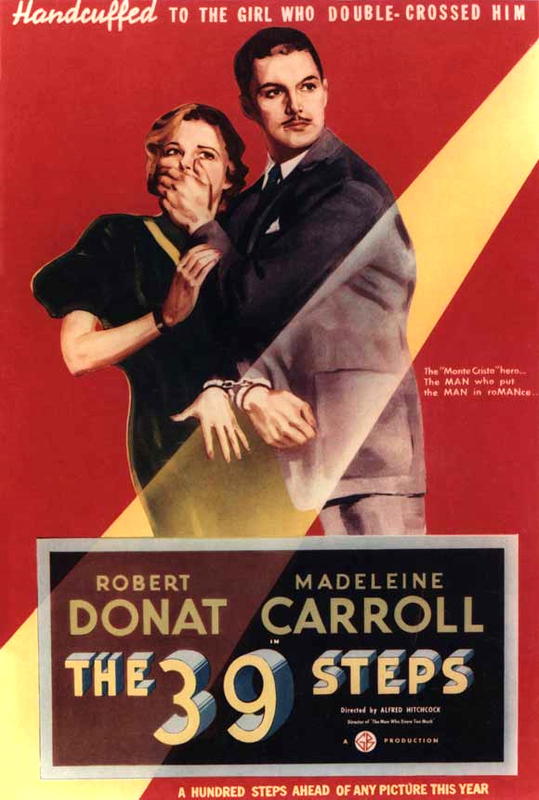 She alludes only vaguely to something called the 39 Steps, said to be somehow involved in the nefarious plot. Hannay doesn’t believe her at first, but is convinced later that night when she turns up in his bedroom with a knife plunged into her back. Knowing he’ll be implicated in Annabella’s murder or killed by the enemy agents if he stays, Hannay decides to flee to Scotland, where Annabella’s next contact (Godfrey Tearle) is waiting to give further instructions. When the police catch up to Hannay on the train, he barges into the compartment of Pamela (Madeleine Carroll), a young woman traveling alone. Hannay begs Pamela to keep his cover, but when the police arrive she identifies him as the fugitive they’re hunting for. Hannay manages to evade their grasp this time – but with both the law and foreign spies on his trail, can he keep running forever? And what – or who – are the 39 Steps? This is an official entry in the Classic Movie Blog Association’s Hitchcock Blogathon – one day, twenty blogs paying tribute to the Master of Suspense, director Alfred Hitchcock! Whether you’re new to Hitchcock or a lifelong fan, today is the day to get a variety of bloggers’ perspectives on his greatest films, whether they be well-known classics or obscure gems. Check out the CMBA blog for a complete list of participating sites. I want to start off this review by thanking the Classic Movie Blog Association for hosting this Alfred Hitchcock blogathon. When I first got word of this event, I knew I wanted to participate, but I was unsure of which film I should focus on. I could have chosen one of my old favorites – like Notorious (1946), Rope (1948), or Rear Window (1954) – but I didn’t feel like I had anything new or original to say about these much-lauded classics. So I started to peruse the Netflix Instant options to see if there were any other Hitch flicks available that I hadn’t yet seen. That’s how I came across The 39 Steps, which I had heard of but had never actually taken the time to sit down and watch. So I’m grateful to the CMBA for giving me a reason to check this film out – because I think it may be a new favorite. This Monday: CMBA Hitchcock Blogathon! The Classic Movie Blog Association‘s Hitchcock Blogathon is coming up on Monday, and I am positively oozing with excitement. There are twenty participating blogs, making it the biggest CMBA blogathon yet, as well as the very first blogathon in which my baby blog will have taken part. Basically, when you log onto the CMBA site on Monday – or open up your RSS reader, if you’re as addicted to classic movie blogs as I am – you’ll see a long list of posts from a wide variety of bloggers sharing their thoughts and impressions of Alfred Hitchcock and his films, both the classics and the obscure treasures. 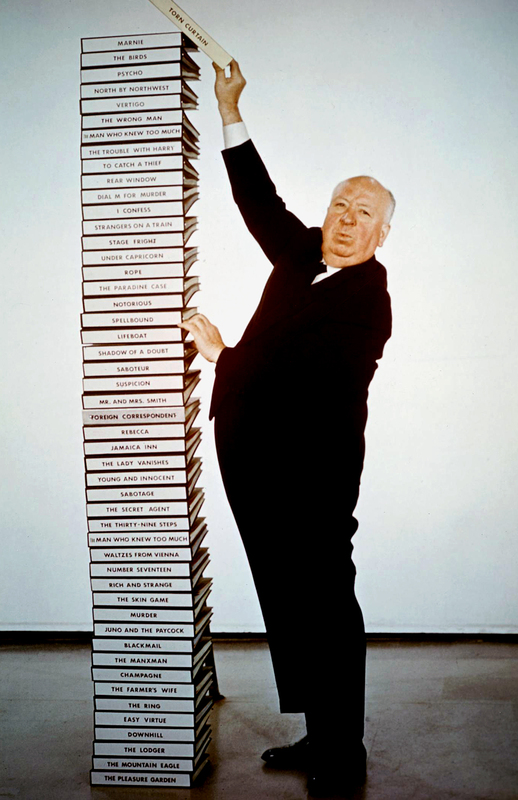 Everyone is committed to at least one post, but I know some are planning more; I hear Rachel over at MacGuffin Movies will be marathoning new reviews of Hitchcock films all day. As for me, I’ll be keeping it simple yet (hopefully) intriguing with a review of 1935’s The 39 Steps, one of Hitchcock’s most well-known British films but still considered obscure to most casual movie-watchers. In fact, it’s one I probably would’ve taken a long time to get around to seeing if it hadn’t been for this serendipitous blogathon. 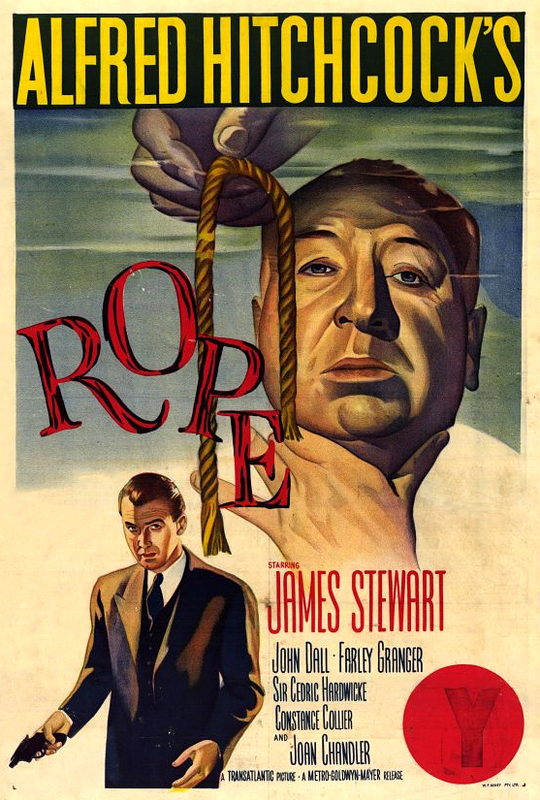 Come back on Monday to hear what I thought of the film, and don’t forget to check out the other participating blogs for what are sure to be some excellent reviews and musings on everyone’s favorite Master of Suspense. Mr. and Mrs. Smith (1941) – Carole & Co.